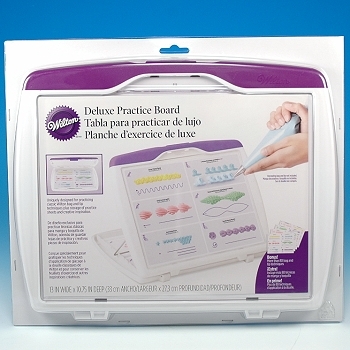 Practice you piping skills using this Deluxe Practice Board. Practice makes perfect! 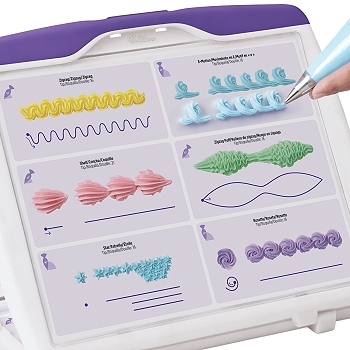 Our Deluxe Practice Board will give you the confidence and skills to create incredible cake designs. 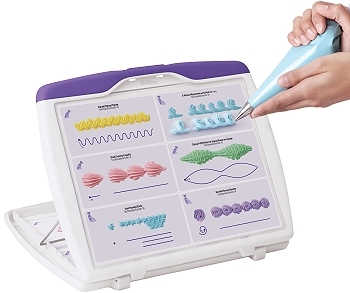 • Clear flip-up decorating window opens easily to slip in practice sheets and can also be removed for cleanup. • Wide ample area for practicing Wilton bag and tip techniques. • Large storage area for practice sheets and creative inspiration. 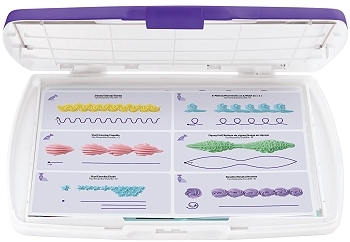 • Sturdy case locks in a 90-degree angle to closely simulate the side of a cake, or use closed for the top of cake. • More than 80 bag and tip techniques for buttercream and royal icings with easy-to-use cake decorating instructions.